Following my recently begun and ongoing foray into teaching IELTS, I thought I would revisit my Top 10’s in ELT series and offer up a list of the resources that I have found most helpful in my IELTS journey so far. The focus of this Top 10* post will be Academic IELTS, as I haven’t taught General IELTS thus far. Of course, the listening and speaking components are the same, so some aspects will be transferable. Click on any picture to be taken to a description of the source (books) or the source itself (websites). Written by Pauline Cullen and published by Cambridge University Press, this is a book I initially came across while working on the pre-sessional at Sheffield University last summer. 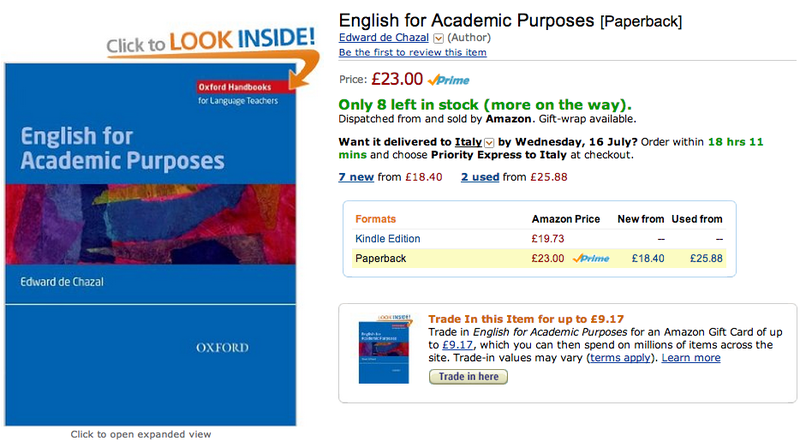 I have since used it with my IELTS students here in Palermo, and found it to be a great resource. It cleverly combines a focus on and practice of each of the four IELTS components with useful, relevant vocabulary input and practice. It is also packed with ‘Test Tips’ which are act as a useful reminder of what to emphasise to students. Also published by Cambridge University Press (unfortunately I am not on commission…), Complete IELTS was written by Guy Brook-Hart and Vanessa Jakeman. There are similar books available for other bands, but this is the one I have been using. What do I like about this student book? It’s user-friendly, it integrates the grammar and vocabulary with focus on the different elements of the exam. It also has a really useful Writing Reference at the back of the book, which breaks down all the different task types that students might meet in Writing Part 1, with clear information, tips and models to help them face these different task types, and highlights the different question types that students might meet in Part 2, again with information, tips and sample answers to guide them. Ready for IELTS is published by Macmillan and written by Sam McCarter. This has been another valuable resource for me, for the following reasons: It contains four ‘Ready for…’ sections, one for each exam component, which offer a guided discovery approach to IELTS reading, writing, speaking and listening, and is also full of useful tips (‘What to expect in the exam‘, ‘How to go about it‘ ‘Don’t forget‘ boxes can be found throughout). It contains plenty of test practice opportunities but rather than being empty practice, the book makes a real effort to help students improve, rather than hoping sheer repetition will get them there. Finally, and perhaps a little shallow, I also like how colourful and visually appealing it is! This fantastic pack of activities and games, written by Jan Marks, is very useful for livening up IELTS prep classes while at the same time ensuring that important information is thoroughly hammered home. Like the earlier-mentioned Vocabulary for IELTS Advanced, I first met this book during the summer, as it was one of our resource books for the entrance exam preparation component of the pre-sessional, and found it very useful. Depending on the length of your sessions, these activities can be used independently or to supplement a given lesson that you are doing. Like the rest of the British Council Learn English site, this is an invaluable source of material for students and teachers alike. Practice materials and advice that you can point your students towards or have a perusal of, yourself! More quality materials from the British Council, this time aimed at teachers of IELTS, very helpful for guidance in making IELTS come alive in the classroom. This page is part of the collection of resources for teachers gathered under the name ‘One stop English’. Amongst all the resources for different types of English (e.g. Business English, English for Children etc.) there is a section dedicated to exam preparation within which can be found the IELTS page. The material is divided up into categories, one for each exam component, one for strategies, one for exam orientation and a nifty little selection of activities requiring ‘Minimal Resources’. A list of IELTS resources wouldn’t be complete without a tipping of the hat to IELTS.org, home of IELTS on the web, and the Facebook page associated with it. IELTS.org has sections dedicated to test-takers, organisations, researchers and teachers. The Official IELTS Facebook Page publishes regular quiz questions relating to the exam and language typically used in the exam, with the answers following 24hrs later. If your students use Facebook, it’s worth pointing them at the Facebook page, and certainly they can benefit from looking at the test-takers section of IELTS.org. I hope you find this list useful. And now, I look forward to hearing your suggestions for no. 10! Now that I am (temporarily) teaching EAP (English for Academic Purposes), I thought I would combine my Top 10’s in ELT idea with my useful EAP resources idea… Here is a list of great resources for EAP teachers and their students. As with all the Top 10 (+) lists, feel free to comment and suggest additional resources – new ideas always welcome! 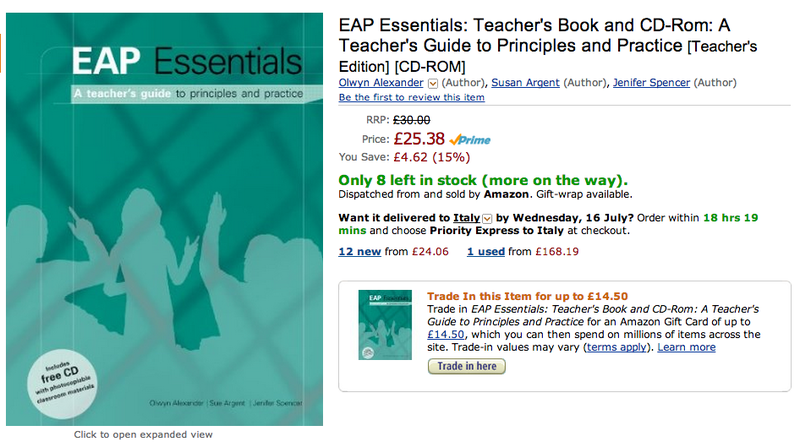 EAP Essentials – by Olwyn Alexander, Sue Argent and Jenifer Spence. This comprehensive take on EAP has the added benefit of being available in electronic form. (Generally a good thing if you are in the habit of moving from one part of the world to another on a regular basis!) It deals with the history of EAP, methodology, language, criticality, skills and more. On the OUP ELT blog, you can find a number of blog posts that are EAP-related. Click on the picture to be taken to the results of a search for these posts. Screenshot from Julie’s post about this wonderful book that she produced. Writing materials is something we all do a bit of, even if it’s just for us to use with our own students. This little book is a great way to improve what you create and learn more about EAP in the process! Highly recommended. EAP Infographics is a project in progress by Adam Simpson, and an ingenious way of presenting EAP language and functions visually. Adam also gives you a run down on the what and how of making and using infographics here . Whether you use Adam’s visuals or start making your own, your students may well find the visuals helpful as a means of making the language and functions clearer and more memorable. They may serve to clear up doubts that learners have regarding meaning and usage too. This is a fantastic tool. It is an interface for corpus analysis, which enables the user to generate definitions, synonyms, collocates and concordance lines. There is a special academic section of the site, pictured above, which is where you want to direct EAP students to, rather than the general part of the site. This tool is helpful in pushing learners to become more autonomous, as you can deal with vocabulary-related questions by directing them to explore a word or chunk using this tool, rather than relying on you. If they use a word or chunk wrongly in their writing, you can also direct them to look at it using this tool and try to correct their mistakes independently. Hopefully this approach also makes the correct version more memorable, as more processing would go into the process of correction. Learners may need some guidance initially, as concordance lines can be a bit daunting. The great thing about the concordance lines generated by this site is that they are colour coded by word type, which makes picking out patterns that much easier. Screenshot of (my) Google drive! Of course Google docs is not aimed at EAP teachers and learners. It is aimed at and accessible to everybody. If you haven’t got a gmail account, why not make a dummy account so that you as a teacher have access to this valuable tool? Many universities give staff gmail university email accounts, so you might get one that way too! Google docs is a collaborative tool. It allows multiple users to edit documents simultaneously. It also includes a chat function and a commenting function. The combination of multiple editing and chat function means that it is ideal for group projects and the commenting function makes feedback very easy. I’ve used it a lot in my EAP writing classes recently – in class, students work in pairs or groups to do activities (e.g. write an introduction, write a paraphrase etc. ), compare their output with the rest of the class and I comment on their output too. The end result is a collection of e.g. paraphrases commented on by the teacher, which can then be a resource for students to come back to, if they are struggling with the element in question. I get them to submit their homework this way too, so that it, too, can be compared and become a class resource. Students can learn from their own and each other’s mistakes. And, of course, unlike the usual scraps of paper that students seem to produce when they have to write anything down, or the haphazard notebook full of anything and everything, documents in google docs are easy to come back to and look at beyond the time of production. The University of Nottingham have made this brilliant website based on Avril Coxhead’s Academic Wordlist, which resulted from research she did into vocabulary used in an academic context. Nottingham Uni have developed a collection of tools that make the list even more helpful. For example, you can paste in a text and the site will highlight all the academic words. You can also gap those words out to create an activity for students to do. You could for example do this with a transcript from a lecture: get learners to listen and complete the gaps, thus focusing them on the academic vocabulary. Students could use this tool autonomously too, to help them build up a bank of academic words collected through looking at texts or simply by using the lists and sublists, as well as associated concordance activities. This comprehensive website could be of use to the teacher who is new to EAP and wants to learn more about it (ahem!) as much as for the students it is directed at. Why not divide up the site between your group of students, and get groups of them to explore each section of it. Give groups a little time to discuss what they found, then regroup the groups to present to each other about their section of the website. The next homework could be to try a different part of the website, based on needs, weaknesses and\or interests. “The internet is a great place for English language teachers, if you know to where to look!” …thus began part 1 – a post that was written to bring a group of internet-based gems together, to make it easier for all English language teachers to find and benefit from them. It has turned out to be a popular idea, even gaining a nomination for the Teaching English British Council blog of the month award, BUT it also ruffled a few feathers: In making the list, I left off some brilliant resources! If you click on “albums”, then you can see, at a glance, all the different categories that are in use on ELTpics e.g. predictions, phrasal verbs, adjectives… The project leaders set a new category on a regular basis, inviting everybody to send them pictures to upload into that category. You can also submit photos to be included in older categories. It is important that the photos you upload are your own and that if there are people in the photos (e.g. a picture of students doing an activity), that you have their permission to share those photos too. Linked with the ELTpics initiative above, this blog contains ideas for how you can use photos – taken from the ELTpics stream or otherwise – in your classroom to great effect. Worth a look if you are after some inspiration! This is a website I hadn’t come across before – to the surprise of one of the readers of the original post. Free members have access to the above-pictured resources (nicely indexed in various ways – by level, skill, specialism etc) but can only download .pdf files. If you want access, for example, to an audio track, you’d have to upgrade your membership. It looks as though you can get plenty of mileage out of .pdf access only, though, so worth a look. A 2014 ELTon nominee, this site offers freely available lesson plans and activities based on simplified news articles written by the site owner. Resources are divided up by level and as well as providing written text, there are also recordings of the articles being read aloud. These can be accessed at different speeds. There is also a dictation facility, which you can use with learners, allowing them to listen and type what they hear into a box (containing clues in the form of the dictation text written in asterisks, one for each letter of a word with space between words), and find out if thy are right or wrong. Time for one of my own favourites! This wonderful site allows you to find out about words and chunks of language, through corpus data analysis. You can input a chunk of text and see which words fall into the top 500, the top 3000 and which words are outside of the top 3000, according to frequency of use. You get definitions, synonyms, common collocates divided up by word type. You can also see which register(s) words/chunks are used in and see examples of use, either filtered by register or all registers mixed together. As teachers, we are often faced by student questions regarding usage or student work containing language that doesn’t seem quite right to us, though there is no grammatical reason why it couldn’t be. Wordandphrase.info is great for answering all these queries. Going a step further, it’s a great resource to get students using themselves, as a tool to help them answer their own language-related queries. If you want to know more, or want help using the site, I’ve written a series of posts about the site, including self-access materials to guide students (or teachers!) through use of it. This is another one of my favourites. I hear you wondering, though, if I’ve got the name wrong – what’s science got to do with ELT? Well in fact, this is a site that allows you to search for articles from (as you can see) a range of disciplines. There are no small number related to different facets of ELT too. E.g. this search I did relates to learner autonomy and metacognition. You can search by journal title, author name etc. or browse by broader categories. One good thing about this site is that if you access a particular article, it will then offer you links to another set of articles based on the subject matter of the initial one you looked at. Of course there are the usual quantity of articles that are not freely available BUT, equally, there are plenty that are, and you can download these as .pdf files. So this is a handy way to access ELT-related literature. This great site contains a mixture of classroom materials and other resources e.g. articles and reviews related to pronunciation and listening skills. The site owners, Mark Hancock and Annie McDonald, are successful published authors and materials writers, so the materials are of high quality and the blog content worth reading. Pronunciation and listening are often referred to as the Cinderella skills, those that get neglected, and that are difficult to teach. Well, this site provides the inspiration necessary to get to Cinderella to that ball! This handy little blog fills a niche: It doesn’t offer lesson plans or glossy materials, but what it does do (and well, if the stats I’ve heard about are anything to go by!) is offer a mixture of activities, techniques and ideas that you can very easily use in the classroom. Taking the metaphor of a lesson as a meal, this blog divides aspects of teaching up by course and provides “recipes” for doing things differently and perhaps that little bit better. As an added bonus, you get some actual food and drink-related recipes too! Well worth a visit and bookmark. This site has been around for donkeys years. As well as lesson plans and resources, it hosts some discussion forums, a plethora of articles on ELT-related topics, a site of the month award offered on a – you guessed it! – monthly basis to recognise quality ELT websites, and more. You can also sign up for a weekly email that will bring teaching tips right to your doorstep – or inbox – regularly. This website is an ELTon award winner for Innovation in Teacher Resources, and rightfully so: It contains a wealth of lesson plans based on short films. As well as using these to teach language, the lesson plans deal with “cine literacy” and encourage critical thinking skills development, important in this day and age. All resources are freely available, with the option of offering a donation to support the site and maintain its current “ad-free” format. That brings me to the end of another Top 10! I hope you enjoyed it and will find it useful. To the person who recommended EFL Smart Blog , it seemed a good site (if an interesting colour scheme) but more directed at students than teachers. For my top ten resources for teachers list, there has to be a significant element of the site that is geared towards helping teachers in some way. As you can see by the range of sites listed, there is no fixed format for this help to take, the only stipulation is that utility for teachers, not only students. Keep the recommendations coming – there’s always the chance of a part 3!